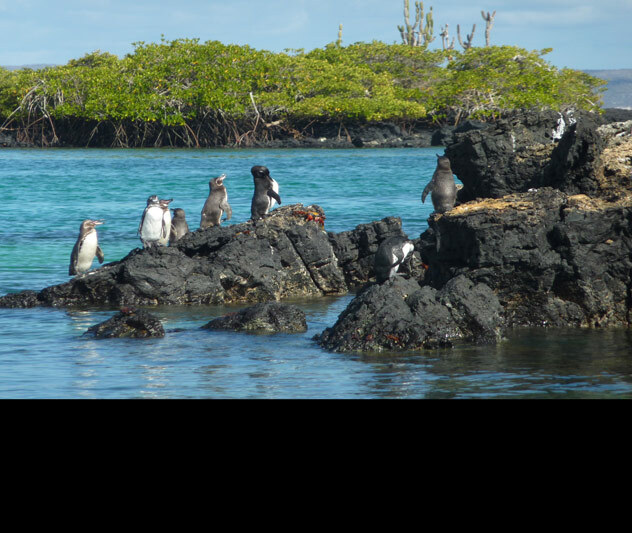 In 1835, renowned scientist Charles Darwin set foot in the Galapagos Islands and thus began the notoriety for the wildlife that inhabit the beautiful archipelago. A five week trip to these islands changed Darwin’s views and inspired On the Origin of Species, one of the most well-known biology texts from the time period. 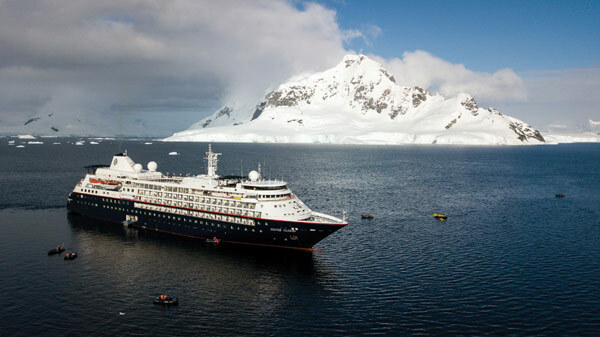 Today, nearly 200 years after Darwin and the HMS Beagle cruised the Galapagos, so can you! And the endemic wildlife is the same, offering a once-in-a-lifetime opportunity to see the top 10 animals in the Galapagos! 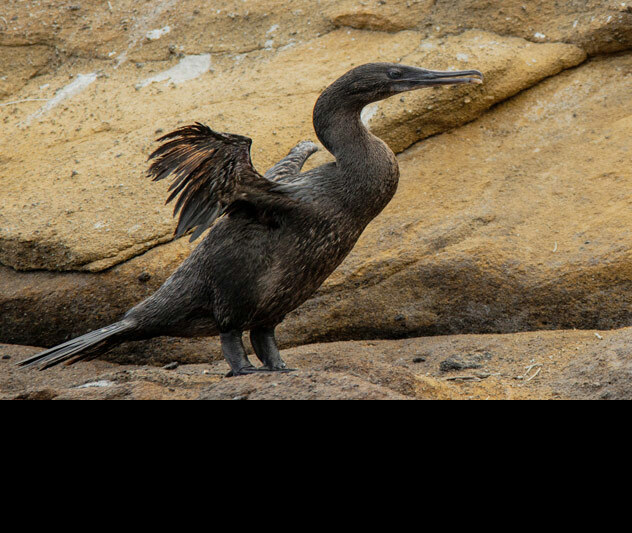 Endemic to the islands, the flightless cormorant has no choice but to stay in one place. With less than 1,000 remaining in the wild, they are one of the world’s rarest birds. When you visit, you’ll get a chance to hear their growling voices, see their craning necks and watch them diving into the water to catch elusive eels. One of the rarest breeds of penguin in the world, there are fewer than 1,000 breeding pairs of Galapagos penguins remaining, most of which reside on Fernandina and Isabela Island. Impressively, these penguins have adjusted to the temperatures of the Galapagos, which regularly exceed 80 degrees Fahrenheit, in a variety of ways. For example, these tiny birds, which measure less than two feet tall and weigh just five pounds, keep cool by stretching their flippers out and taking a playful swim in the crystal blue waters. Did you see that flash of orange scurry through the sand? 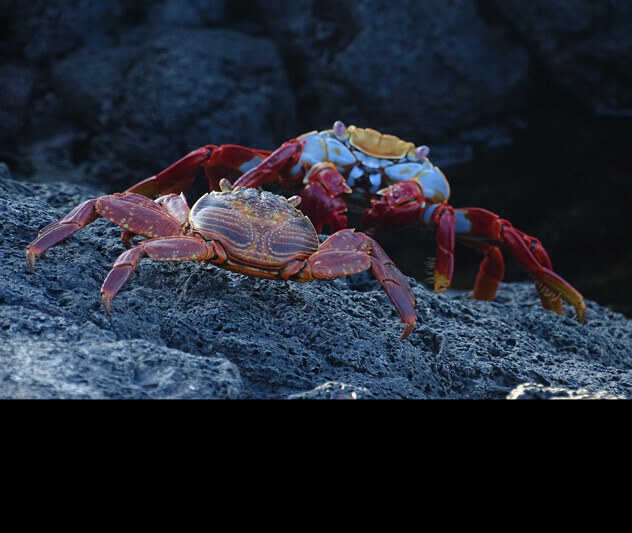 A quick flash might be the only glance you get of these skittish creatures, known for their bright colors and constant presence on the volcanic shores of the Galapagos. When you arrive in the Galapagos on your cruise, you will definitely be greeted by the cutest welcome party in the world: a colony of sea lion pups. Since this area of the world is virtually untouched by humans, these playful animals have no fear and will waddle around, just checking everything out! 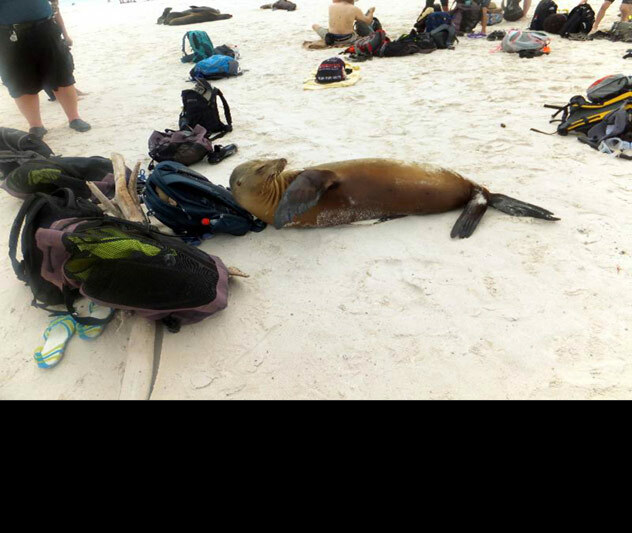 This picture, captured by one of our employees, shows a sea lion lounging, using a backpack as a pillow! Known elsewhere as the dusky gull, this is pretty much the only place on Earth where ornithology enthusiasts can spot them! 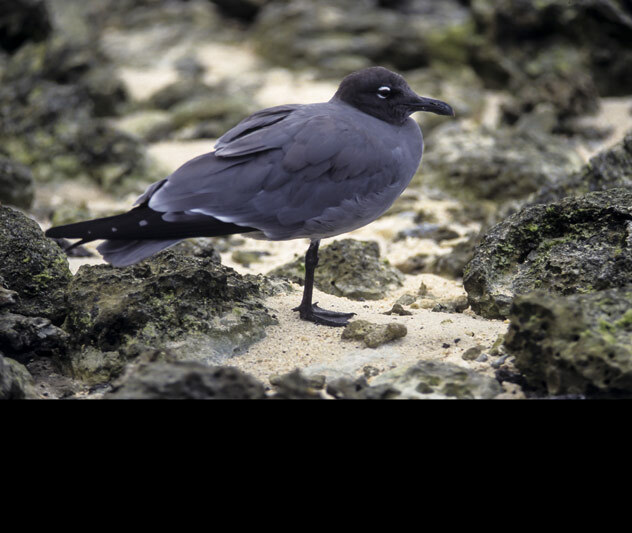 With a remaining population of less than 500, these magnificent gulls stretch up to 20 inches long and are most commonly found on the islands of Isabela and San Cristobal. 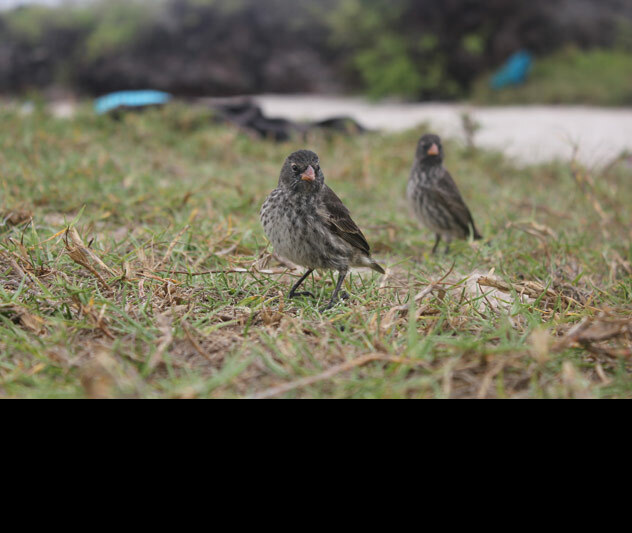 Throughout the archipelago, there are 14 marked species of finches. Of these 14 species, none of them are actually finches, since they are a part of the tanager family of birds. The truly unique thing about these birds, however, is their ability to adapt to their environment over time. When Darwin was exploring the Galapagos, he noted that the birds displayed different traits based on their environment—and this was the foundation of his famous Theory of Natural Selection. The Galapagos marine lizard is a bit of an anomaly among lizards around the world, given that they are able to survive on land, while skillfully diving to depths of up to 30 feet in the water to hunt, where their red and green hue helps them blend in. 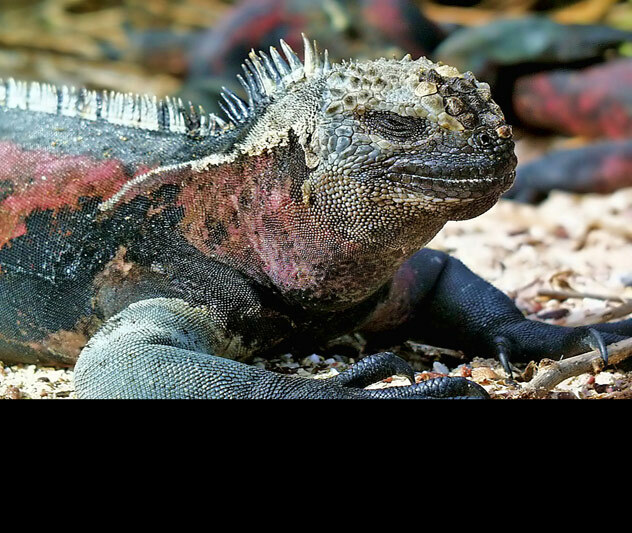 Marine iguanas will look and sound vicious, hissing and making noises, but this is only to get the salt from the ocean out of their noses. These unique birds can be seen soaring high above the water, but never diving in the get food. If they dove in, they wouldn’t be able to take off. 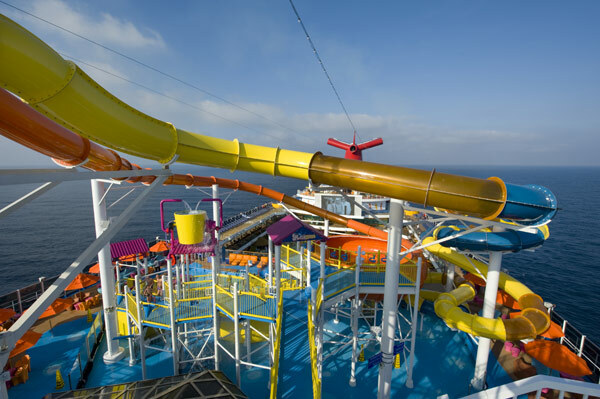 In fact, these flamboyant, red creatures even need a running, downhill start to take off from land! 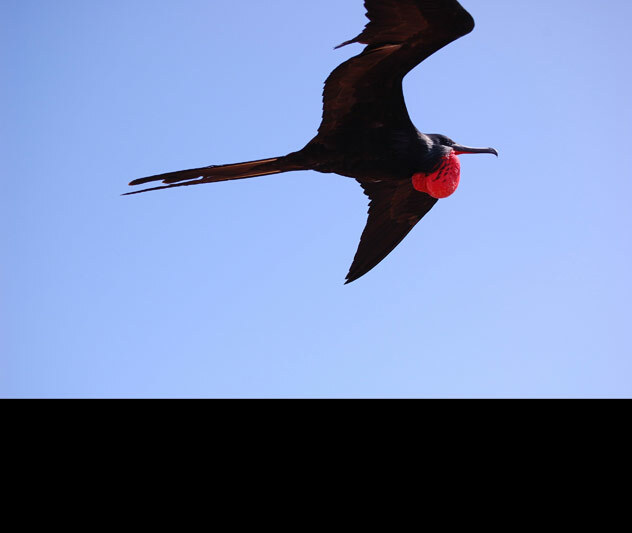 Despite subpar flying abilities, the frigatebird wins parent of the year, laying just one egg per mating season and diligently caring for their chick for longer than most birds. 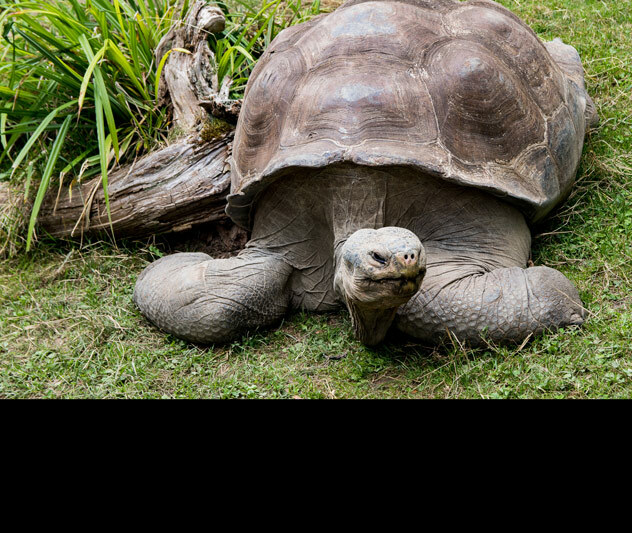 Perhaps the most popular of reptiles on the islands, the giant tortoise weighs nearly 500 pounds and outlives most humans, with the oldest recorded tortoise living to the ripe old age of 152 years old. The most unique feature of these tortoises is their variation, with 15 distinct types identified by Charles Darwin, and determined by the island and environment in which the tortoise lived. “Booby” is a derivation of the Spanish word, “bobo” meaning fool or clown. And the “blue-footed” part? I’m sure you can guess where that comes from. 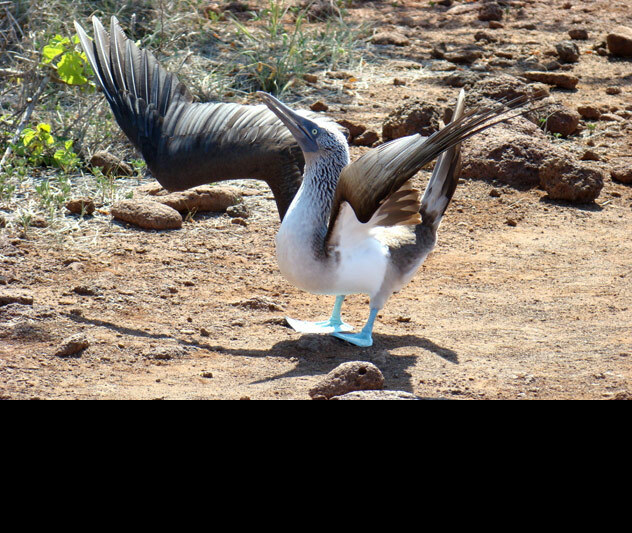 Though not only inhabiting the Galapagos, more than half of the world’s breeding pairs reside here, doing their signature blue-footed booby dances, feasting on fish, and nesting comfortably in small, grounded colonies. 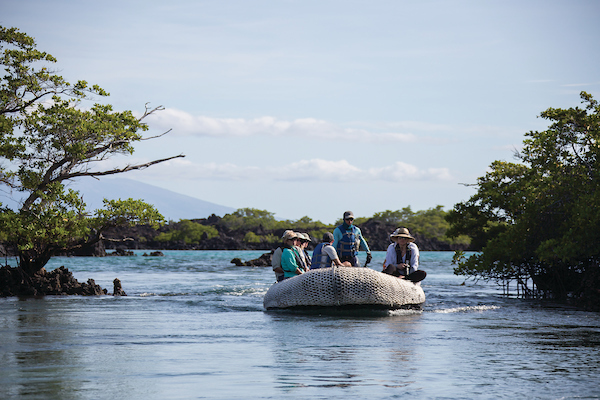 Now that you know about all of the incredible wildlife in the Galapagos, what are you waiting for? 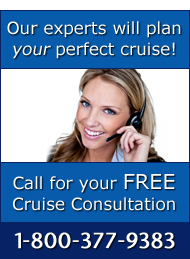 Call 1-800-377-9383 today so one of our expert consultants at The Cruise Web can help plan your once-in-a-lifetime cruise to the Galapagos Islands! 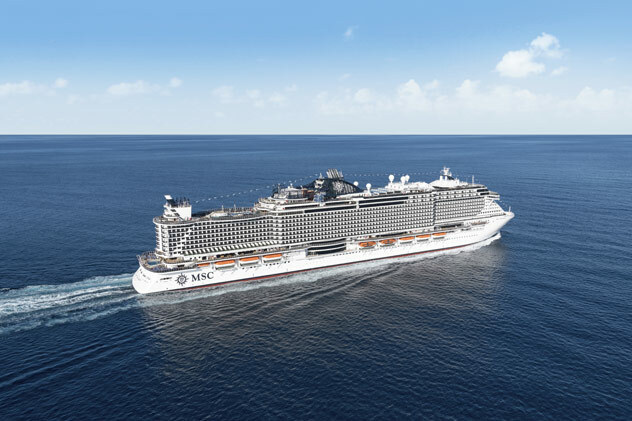 After emerging from her early 2019 dry-dock, Celebrity Summit looks very similar to the recently delivered Celebrity Edge. 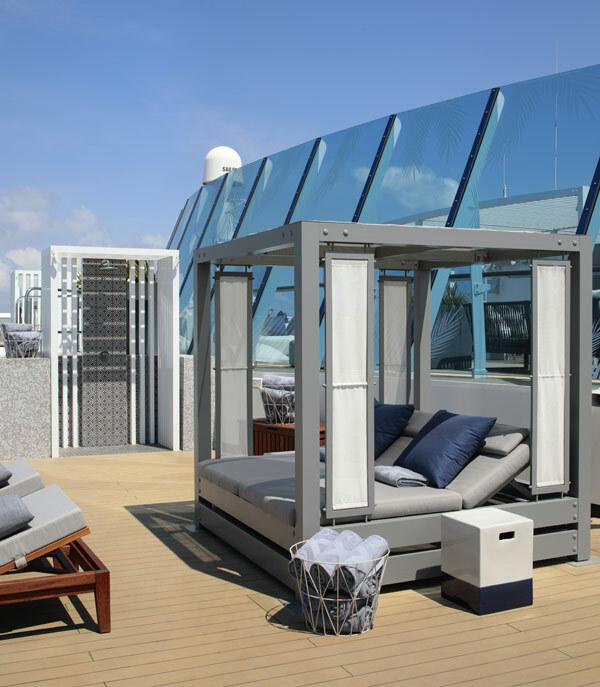 During the refurbishment, over 1,000 staterooms were gutted and rebuilt, with the suites being designed by Kelly Hoppen, designer of Celebrity Edge. 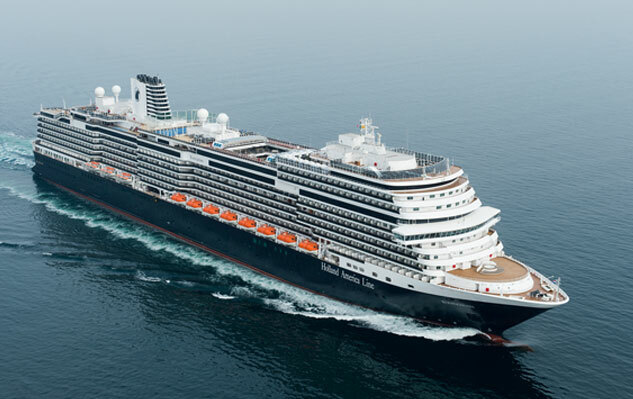 Much like the staterooms, public areas throughout the ship got a facelift. The Main Restaurant, Sunset Bar and Rendezvous Lounge all underwent significant upgrades.